Home to the Council on Foreign Relations, the Harold Pratt House was constructed in 1919 as one of New York‘s grand Park Avenue mansions. It is an ideal location for celebrations, weddings, dinners and conferences. Peterson Hall is a well-lit conference space featuring state-of-the-art technology and is connected to the House by a Marble Hallway. It can be used exclusively by its own private entrance or in combination with the House. Peterson Hall also offers meeting and conference options. Standing: 120 max., Seated: 60 max. 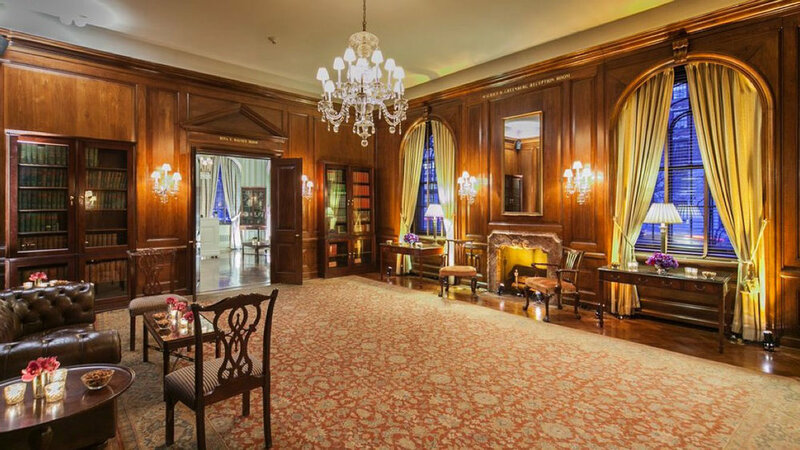 Located on the 2nd floor overlooking Park Avenue, the Library, with its burnished walls, marble fireplace and wrap-around balcony, is an ideal choice for a stately reception or an important dinner. Standing: 40 max., Seated: 40 max. With its vaulted ceilings, this spacious marble hall at the top of the stairwell adds an elegant entrance to a dinner or reception in the Library or Ballroom. Standing: 200 max., Seated: 130 max. The ballroom offers memorable views of Park Avenue through its gracious double-height windows. The grand fireplace, cathedral ceiling, antique chandeliers and beautiful inlaid floor provide a majestic setting for a grand dinner or reception. Standing: 120 max., Seated: 70 max. Crystal chandeliers, hand-carved moldings add drama and fabric paneled walls add warmth to the original Dining Room. The Room’s high ceiling and tall windows displaying tree-lined sidewalks grace this lovely space and provide an elegant setting for ceremonies, receptions or after dinner dancing. Standing: 50 max., Seated: 40 max. The fireplace and wood-paneled walls add warmth and beauty to this most welcoming of rooms. The Reception Room lies between the Drawing and Sitting Rooms and all three can be combined for use as an entire suite for receptions. This corner room with its architecturally designed moldings and decorative fireplace can host an intimate dinner, a comfortable private meeting, or can be used for a reception in conjunction with the adjacent Reception and Drawing Rooms. Standing: 275 max., Seated: 180 max. The Peterson Hall is equipped with the most advanced audio-visual equipment available and offers limitless solutions to enhance your presentations. The hall can also be divided into three smaller sound-proof seminar rooms. The sophisticated lighting system can transform this room from a well-lit meeting space to a stunning setting for dining and dancing.